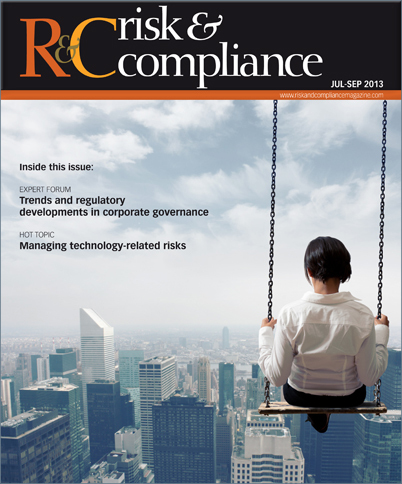 Risk & Compliance Magazine was launched to satisfy reader demand for risk management and regulatory compliance issues, which continue to be a major source of interest to Financier Worldwide’s readers. Risk & Compliance magazine is a quarterly e-magazine dedicated to the latest risk and compliance challenges facing boardrooms, and provides advice on how to tackle these issues. The e-magazine features content from leading associations, academics, risk managers and recognised experts on topics linked to risk management, governance, compliance and developing internal processes and controls. The primary audience comprises senior corporate executives (CEOs, CFOs, MDs, FDs), risk and compliance officers, tax managers, HR directors, fund managers, institutional investors, and strategic advisers including lawyers, accountants and consultants.